Are you seeking inspiration for novel azole scaffolds in your drug candidates? We offer safe and easily handled solutions of CF3N3, C2F5N3, HCF2N3 and CF3CH2N3. 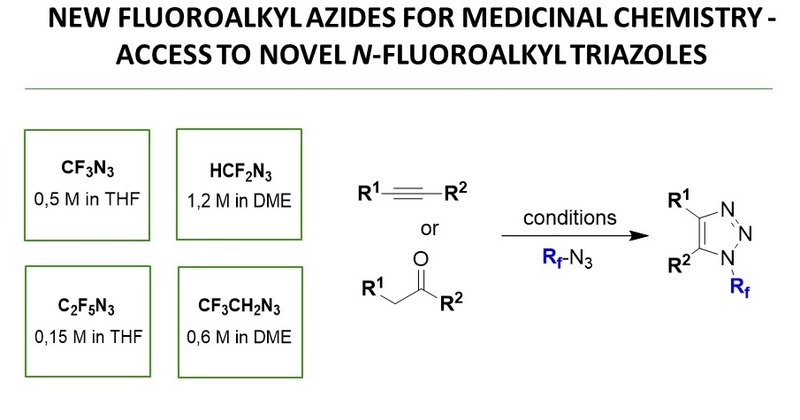 A wide range of N-fluoroalkyltriazoles can be accessed regioselectively in high yields using click chemistry and enamine-mediated ketone-azide cycloaddition. The resulting triazoles can undergo a set of further transformations leading to other N-fluoroalkyl heterocycles. For more info, please select a product from the menu.